Get focused rankings in relevant & targeted markets. Increase in organic search traffic & revenue. 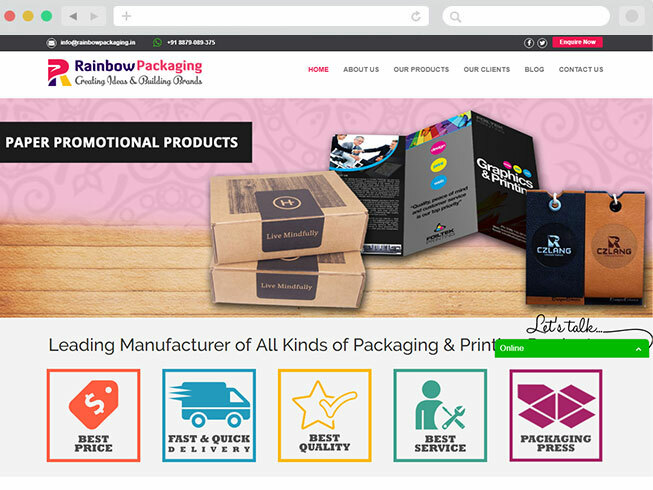 Rainbow packaging is one of the reputed printing & packaging companies in Mumbai. The online presence of the brand was almost negligible. The competition was so high in printing and packaging sector that at a point it was literally impossible for the website to rank. There was no presence of the company on Google search engine. By searching the query for the keyword still the site was not ranking on the 1st page. But in the end we made it possible for Rainbow packaging to show its presence online. Responsive website & Content development. Implementation of white hat techniques. Increase of relevant keywords and analysis of keywords. Getting relevant backlinks for the website. Keyword analysis on the weekly basis so that we can plan for the next step to rank it more higher on Google search engine. The website rank on the 1st Page of the Google Search Engine after few months. Increase in the website traffic because of the presence on 1st page. Increment general ROI Through coordinated SEO efforts.